ROCKLEDGE, Fla. (CitizenWire) — LRM Industries International, Inc. headquartered in Rockledge, Florida, announces the introduction of the HydroDome(TM) 610 composite stormwater chamber. The HydroDome design concept, introduced in 2009, comes from both the efficiency of nature and the ageless understanding by architectural engineers, that the dome is stronger than an arch or vaulted tunnel. The HydroDome(TM) project at LRM was initially code-named “Beehive” with a goal of achieving extremely high space utilization efficiency, with high strength, while using environmentally responsible recyclable materials and processes. This morphed into a domed cell structure to retain the natural field “nesting” efficiency, while adding incredible strength. The new HydroDome(TM) 610 is an extension of the original design, adding storage capacity and maximizing strength through the expanding capability of LRM’s STF Sheetless ThermoForming(TM) technology for the production of large reinforced composite thermoformed products. 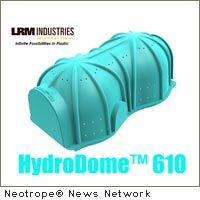 LRM Industries will exhibit HydroDome(TM) at StormCon(R) 2010 in San Antonio in booth #925-927. LRM Industries International, Inc. was established to commercialize TPF ThermoPlastic Flowforming(TM) technology, a radically different and award-winning process technology for producing large, feature-rich, long-fiber reinforced thermoplastic composite parts in one fully automated molding operation. With the TPF ThermoPlastic Flowforming(TM) and the new STF Sheetless ThermoForming(TM) technologies, LRM enables innovative applications and designs in the use of plastics and thermoplastic composites to produce very large unitary structures where, to-date, it has been viewed as cost prohibitive or lacking in strength and structural integrity. Visit www.lrmind.com for more information. News Source: LRM Industries International, Inc. :: This news story was first issued by and is Copyright © 2010 the Neotrope® News Network – all rights reserved. Originally published on CitizenWire™.